We all have those days when we feel a little down in the dumps and it can be difficult to find motivation or even attempt to bake, right? 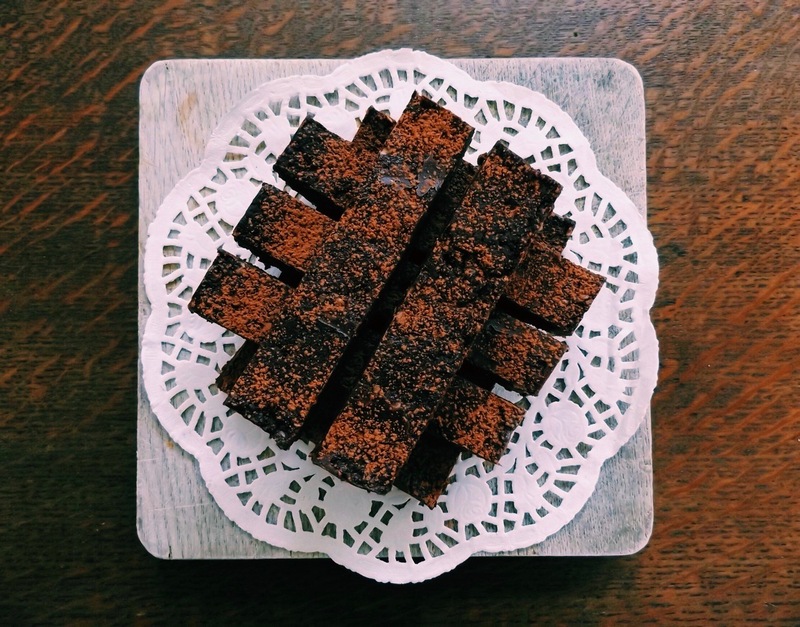 I tend to crave sweet things when I feel tired (and hormonal) and this is one of my ‘go-to’ recipes when I’m feeling a little low. It’s quick, simple and the ingredients you will more than likely find in the cupboard. I use Medjool dates over regular dates as they offer that extra toffee like squidginess but both work well here, so use what you’ve got. I recommend dusting with cocoa powder and cut into small finger slices as it’s fantastically rich. Line a small cake tin (I used a 2lb loaf for mine), leaving excess parchment paper hanging over the edges to help with lifting out later. Melt the chocolate over a double boiler and leave to cool. Blend the dates in a blender until you get a fairly smooth paste. Add the melted chocolate, oats, peanut butter and coconut oil. Blitz together. Spread the mixture out evenly into the prepared tin and chill in the fridge for at least 2 hours. Lift out of the tin, dust with cocoa powder and cut into fingers. Served best with pyjamas, chunky socks and a movie. This entry was posted in Uncategorized and tagged Chocolate, dairyfree, vegan. Bookmark the permalink.